If you upgraded your Windows 7 SP1 or Windows 8.1 computer to Windows 10, you might want to downgrade to your previous version, here’s how to do it. If you upgraded your computer running Windows 7 or 8.1 to Windows 10 and are finding things not working correctly or if you’re simply not a fan of how it works, you can go back to your previous version. Here’s a look at how to do it. Important Notes: You only have 30 days to make up your mind on whether or not you want to revert. Also, during the first 30 days, definitely do not delete your Windows.old folder located in the root directory of your C: drive. If you wait longer that the 30-day limit, then you’ll need to do a clean install of your previous OS. Also, make sure all of your necessary files from Windows 10 are backed up before starting this process. Just like when you upgraded windows 7 or Windows 8.1 to 10, all of your files should come with you. But nothing in tech is definite. We stress backing up your data in all articles like this, and you might be tired of hearing it, but having secure backups is one of the most important things you need to do as a computer owner, no matter what operating system you’re running! This practice also applies to your iPhone or iPad, Android device, Windows Phone, or whatever mobile device you have. I have made sure that all of my important files, photos, and other important data is backed up. I am ready to go back to my previous version of Windows. To start go to Settings > Update & Security > Recovery (you can get there faster by using Windows Key+I), and in the list on the right you should see Go back to Windows 7 or 8.1 – depending on which version you upgrade. Click the Get started button. 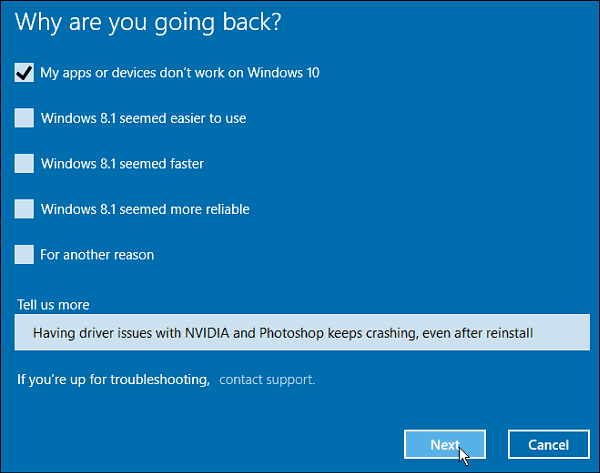 In this example, I’m going back to Windows 8.1, but the process is the same for Windows 7. Microsoft will ask you why you’re going back – just provide a reason and click next. Now you’ll need to navigate through a series of messages, starting with the one shown below. It reminds you to leave your PC plugged in, and that after going back you have to reinstall some apps. You’ll also be reminded, as we did at the top of this article, to make sure your data is backed up. 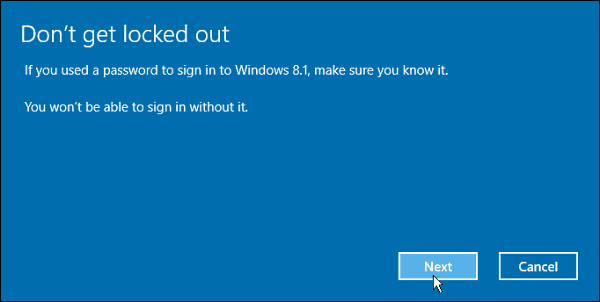 Make sure you know your password for the previous version of Windows, so you aren’t locked out. This is more important if you’re downloading to Windows 7, or didn’t use the same Microsoft Account to log in with Windows 8.1. Now you’re on your way back to your previous version. You’ll see a message: Restoring your PC will restore your previous version of Windows, and your system will restart several times during the process. When it’s done, you can do some housekeeping and reinstall certain apps. It’s also important to note that yes, you can upgrade to Windows 10 later if you decide to, and it will still be free. 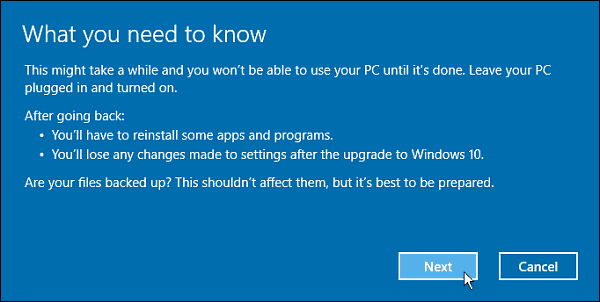 In fact, once after I downgraded to Windows 8.1 and logged in, the message to upgrade to Windows 10 popped up right away. And, for more on the new operating system from Microsoft, check out our full collection of Windows 10 articles — we add new content daily! Or for specific questions, or to talk shop with other Microsoft geeks, join the free Windows 10 Forums. don’t like the pop-up’s showing stuff I’m not interested it. Might have to resort to this as my desktop computer (which has a Radeon 5450 video card) is causing start-up issues. The problem is well documented as “AMD Catalyst 15.7.1 causes black screen before login screen to Windows 10”. No patches from AMD yet, but just wondering if any of your readers have encountered the same issue and whether they know of a workable fix. Otherwise, welcome back windows 7! Ok, I did all that, but instead of having 8.1 back I received an error for system restart. It has restarted 10 times now with the same result. I tried to do a system restore but had the same result. Please help! 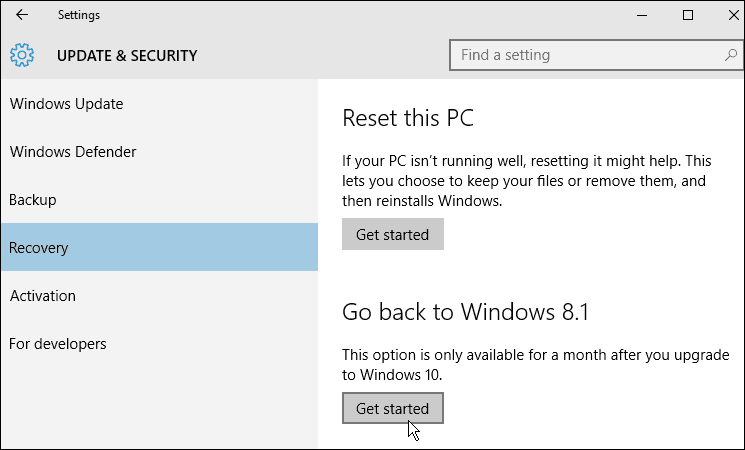 If you do get back to Win 8.1 and want to retry Win 10 may I suggest that you follow the link to Easus System GoBack Free before attempting to go with win 10 again. Thanks! Unfortunately the only thing that would actually work was doing a factory reset. Everything else (system image, recovery, etc) would act like everything was fixed, but then on the restart I would get the error again. I think I would like to try 10 again, I really liked some of the new features, but unless there is a way to make sure the Wi-Fi problem is fixed I just can’t. Thanks to for the help and the link though, I will check it out. I did this on one of my systems, and the “restored” system went straight to a “bsod” twice then tried to update/ repair the start sequence. In the end I had to do a total restore from a backup. Thank goodness I had the thing backed up multiple ways or I’d have been DIW (Dead In the Water). Once again I am disappointed with the whole Microsoft experience. I tried win 10 for 5 days. 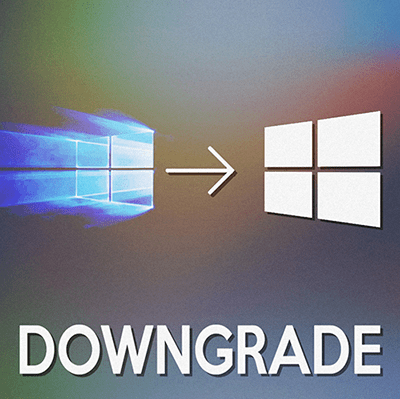 I tried to downgrade to win 7 and I got the message Sorry…….the needed files have been removed. I checked my old windows file and there was a folder downgrade 10 to previous edition. I thought this was a file I needed to downgrade. I clicked to open and got the message – THIS FOLDER IS EMPTY. What happened? Did you ever find an answer? Haven’t had windows 10 for the thirty days yet, but the return to windows 7 says the files have been deleted. Still have windows.old directory with data intact. Very disappointed with another windows os…I will lose programs i don’t have the installation CD’s for because I trusted microsoft. Does anyone know what files the system is looking for? I did not like Windows 10 very much, looked better but my computer was running 20% hotter and almost daily crashes (never once crashed on 8.1 pro in a year for me). so I reverted back… all seems to be ok BUT I have NO SOUND, and cannot seem to get it back. All settings saying things working properly but got 0 sounds on the computer since the roll-back. Do you have a solution? I followed the procedures to roll back to 8.1 and now my laptop is a mess. I can’t get to the 8.1 interface and am stuck on the desktop. So I can’t use any other applications other than what is on the desktop. I’m probably going to have it professionally repaired and I’m not happy. I have updated to win 10. And downgraded bcoz it used 100% CPU every time I played videos. It said restoring previous version then had screen of launch system repair. And start windows normally. System repair cannot repair the computer automatically. It’s restart again again . what to do??? I downgraded back to windows 8.1 from the windows 10 and now my folders are gone that I had saved in my mail folder. When I open up the mail, it shows the inbox, outbox, deleted, but there are not any folders that I created and had saved emails in. Where can i find these? then decided I didn’t want to keep it. I reverted back to Windows 7 and can not find my pictures. Why is it only a month? Some people need a lot more time than that. i have window.old folder but i don’t get GET BACK TO PREVIOUS VERSION option…what should i do?? Came to desktop. Win 10 had tried to load itself !!! Declined, now desktop sitting Hung with, restoring your previous verdiin of windows. Furious windows10 tried to LOAD ITSELF! Get my computer back running !!!!!!!!!! My Computer did load itself, I did not ask for windows 10 but I got it, now I can’t figure out how to get rid of it. Nothing works with it. I was working on my laptop when a “get windows 10” pop up occurred. I hit June 4th which was the latest date they allowed you to enter. There was no way to enter “NO!”. I turned on the laptop the next day and Windows 10 is staring me in the face. “welcome to windows 10”. Its awful. I hate it. I want windows 8 back. I haven’t tried the downgrade but after reading the above I fully expect to lose everything. Some smart attorney should start a class action suit against Microsoft for all the people who now have screwed up computers, missing data, programs, apps, etc. My philosophy is if it aint broke don’t fix it. we don’t need an upgrade every year. But Microsoft needs the money. I’m really angry that Windows 10 INSTALLED ITSELF. I didn’t ask for this headache. Microsoft should have to pay to get my computer fixed. Jerks!!! CAN I JOIN THE CLASS ACTION SO I CAN HAVE WINDOWS 7 BACK. HAVING WINDOWS 10. WHICH SEAMS TO WANT TAKE CONTROL OF YOUR COMPUTER WITH NEWS SEGMENTS, ETC. THAT ARE FULL OF PROPAGANDA TO SUIT THEIR OWN ENDS. THE AMERICANS ,RUSSIANS AND CHINESE ARE VERY GOOD AT IT. THINKING PEOPLE WILL NOT WEAR IT UNDER ANY REGIME. THE AUSTRALIA GOVERNMENT IS ALSO GOOD AT IT ON BOTH SIDES OF POLITIC. I ONLY HAVE A COMPUTER TO ADD TO MY BEING ABLE TO PURCHASE GOODS AND SERVICES AND CONTACT FRIENDS IN AUSTRALIA AND OVERSEAS. HOWDERE THEY PRESUME THAT I WANT THIS INFORMATION . I TURN SELLS AND RELIGIOUS PEOPLE AWAY FROM FRONT DOOR AND I REGARD THIS AS A SIMILAR TACTIC. (ONLY FRIENDS & RELATIVES) AND BELIEVE THE SAME OF THE MEDIA. ALL THAT IS ON TELEVISION AND WHAT COMES TO YOU FROM YOUR COMPUTER IS NOT TRUE BUT CAN BE PROPAGANDA TO COVER UP THE REAL TRUTH. ONE BUT FOR OURSELVES,TURKEY, THE WORLD 2 WAR IN EUROPE VIETNAM AND NOW AFGHANISTAN. NONE OF WHICH WE HAD ANYTHING TO DO WITH . I used the reset option on my Sony Vaio laptop having Win 10 home and now its stuck on the login screen. No password is working have tried umpteen times, have reset it umpteen times through my phone where the Microsoft account opens but not working on my laptop. Called Microsoft support – no solution. What to do – the screen shows my pic and name and the pw bar.